It’s a reasonable question to pose, “how do I quickly learn about the best that astronomy education research has to offer?” Exhaustive reviews of astronomy education research (Adams & Slater, 2000; Bailey & Slater, 2003, 2005; Slater, 2008), clearly position astronomy education research, AER, as a its own scholarly discipline existing within a rich field of robust student misconceptions and varied instructional strategies designed to intellectually engage students. Indeed, the publication of National Research Council publication, Discipline-Based Education Research: Understanding and Improving Learning in Undergraduate Science and Engineering (NRC, 2012) highlights astronomy as one of the principle disciplines of education research, elevating it to the same level as physics education research, geoscience education research, chemistry education research, engineering education research, and biology education research (listed in no particular order). Yet, if it is so important, where is all the astronomy education research? Unfortunately, because AER is still a fledgling field in comparison to its older brother of physics education research, PER, much of the AER created scholarly knowledge is just beginning to show up in refereed journals. Beyond the some 150 studies summarized in reviews from refereed journals (reviews cited above), most of astronomy education research seems just incredibly difficult to find. Some efforts like SABER (http://astronomy.uwp.edu/saber/) have worked to gather disparate astronomy education research articles in journals beyond the Journal of Astronomy & Earth Sciences Education (http://JAESE.org) or the deceased Astronomy Education Review (http://aer.aas.org), but it just seems like more should be out there, doesn’t it? Most of astronomy education research that currently exists is hiding in deep in what is known colloquially as the “grey literature.” Grey literature is the scholarly work that has been done and presented at conferences or exhaustively written up in dissertations, but never formally published in refereed journals. For example, at every American Astronomical Society and American Association of Physics Teachers meetings, there are special sessions, both oral and poster, overflowing with astronomy education research scholarship reports. Bailey (2010) reports that in a recent search of the SAO/NASA Astrophysics Data System (ADS), a query of “education” in abstracts for oral or poster presentations at American Astronomical Society (AAS) meetings yielded more than 1300 abstracts since 1992; nearly 600 of those were from the year 2006 or later. And there are similarly impressive numbers of astronomy education abstracts, both invited and contributed from meetings of the American Association of Physics Teachers sub-section now called space science and astronomy. This is the domain of the grey literature. The best example of the AER grey literature is probably the most well-known study of understanding in astronomy ever done. It was publicized by Philip Sadler and is presented in the video A Private Universe (Schneps 1989). The video begins with clips of interviews with several alumni, faculty, and graduating seniors from Harvard University. Of the 23 individuals interviewed, 21 could not give a scientifically acceptable explanation for the cause of the seasons or the phases of the Moon. Although the misconceptions so cleverly illustrated by A Private Universe were garnered through methods that probably do not conform to the rules of reliability and validity that define today’s DBER, the video’s widespread influence cannot be understated. The Private Universe video served as wake-up call for the astronomy education community, much like Hestenes and colleagues (1992) Force Concept Inventory served as a rallying point for PER. For many, Private Universe marks a major milestone in the evolution of AER. Yet, nowhere does Private Universe show up as a refereed journal article. As another example, consider the Test Of Astronomy STandards, the TOAST. Conceived of by Stephanie Slater and colleagues, this pretest-posttest, multiple-choice survey of astronomy knowledge is widely used across the international astronomy education research community. Yet, its only formal citation prior to a recent formal publication (now available online for free at S. Slater, 2014) is from an appendix of the book, “Discipline-Based Science Education Research: A Scientist’s Guide” published by Pono Publishing. Books are only sometimes considered by university tenure and promotion review committees as refereed scholarship, yet often hold a treasure trove of wonderful work. It is worth remembering that sometimes AER scholars have so many great projects going on that they just don’t get around to formally publishing everything that is meritous. In fact, this isn’t true of just AER, but is a rarely whispered truth to all of scientific scholarship that we rarely tell students about. If you really want to see the magic of the grey literature, consider dissertations. Dissertations are a secret place where exhaustive reviews are found. It is often in the second chapter of astronomy education research dissertations where work is widely reviewed in the dreaded literature review chapter. Sometimes found as PDF’s at ProQuest.com, many astronomy education research dissertations review tens, if not hundreds of studies, conference presentations, poster contributions, and other dissertations. Together, this represents a tremendous amount of work reviewing, synthesizing, and recasting previous work that is well worth the time to hunt down, especially if you are trying to get into AER. So, if you are trying to find the very best and most influential astronomy education research work and aren’t having much luck, you need to know that you are not alone. Most Ph.D. dissertations are never published, and an even smaller percentage of confer ence presentations end up as refereed journal articles. Just because something never makes it into a formal refereed journal, doesn’t mean that it is bad work; in fact, there are plenty of published refereed journal articles that represent bad scholarship. Rather, it just means that the scholarship cycle was never completed. In reviewing astronomy research, you need to be a critical consumer of the research you are considering and realize that the formal citation rate of the journal you are looking at only is one aspect you should use to judge its relative importance. Adams, J. P., & Slater, T. F. (2000). Astronomy in the National Science Education Standards. Journal of Geoscience Education, 48(1), 39-45. Bailey, J. M., & Slater, T. F. (2003). A review of astronomy education research. Astronomy Education Review, 2(2), 20-45. doi: 10.3847/AER2003015. Hestenes, D., Wells, M. and Swackhamer, G. (1992). Force concept inventory. The Physics Teacher, 30: 141-158. Slater, S.J. (2014). Development and validation of the Test Of Astronomy STandards– TOAST. Journal of Astronomy & Earth Sciences Education, 1(1), 1-22. The reality is that HOW DO YOU DO A CONFERENCE really well is not written down anywhere. It’s really folk knowledge. Its knowledge experts share it in dark corners with mirrors, standing in the fog out on some deck somewhere close to the ocean on the pier secretly sharing how to hack a conference. So with that, what goes on at conferences? One of the main things that you see at conferences are keynote talks, or sometimes they are called plenary talks, sometimes they are called prize award wining talks and these are talks by real leaders in the field, or people you really want to hear from. Maybe they are very famous book authors, or maybe they are very famous scientists the organization has either given them a lot of money to come give a talk, or they have given them awards. 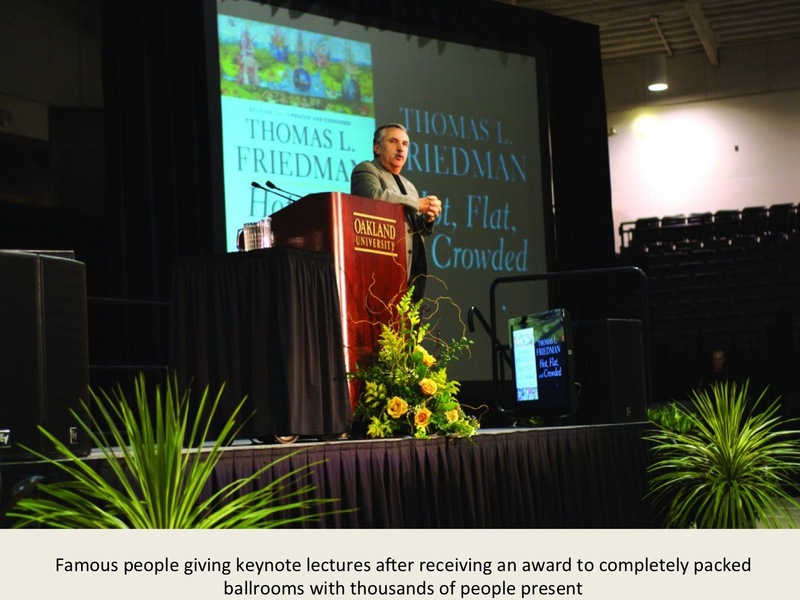 Conferences sometimes attract big name speakers by saying, “in order for you to come get this $1000 award or this $5000 life achievement award or this $10,000 mentoring award, you actually have to come to the conference and give a talk.” And these are always very well attended. Usually there is nothing else going on at the conference at the same time, so everybody from the conference is usually there. It’s in a giant ballroom that can have 1000, 2000, 5000, 10,000 people in them. That’s a pretty important part of many conferences. Now that’s not the only thing going o n at a conference. In a big conference you may only have 4 of these sorts of highlighted, but most of the time, time at the conference is given to what are called contributive talks. These are much, much shorter talks and these talks are not given to rooms of thousands of people. These are talks given to rooms that may have 1000 chairs but have far fewer people in them. 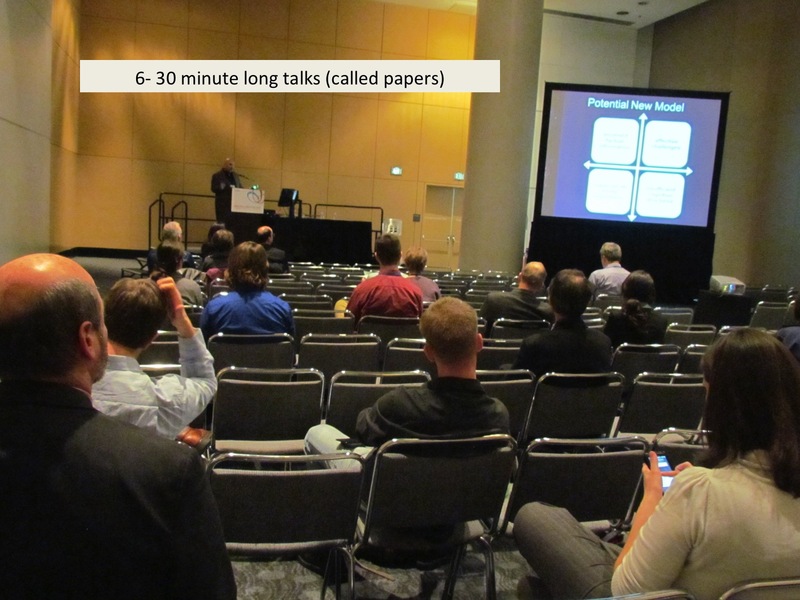 Here is a picture of a contributed talk at the American Geophysical Union. This is where you can speak most often: in general you are standing at a podium a long way away from the audience using a remote control to run a screen that you can’t actually see, to a group of people who are only really there because they also are giving talks in that session and they were too embarrassed to walk in late and they didn’t want to walk out of yours. So there could be contributing talks, or papers they are called, are kind of the mainstay of the conference. And in general these things are not very well attended. How many people are in attendance is in no way a reflection of how good the talk is or how important it is, which is as odd as it sounds. 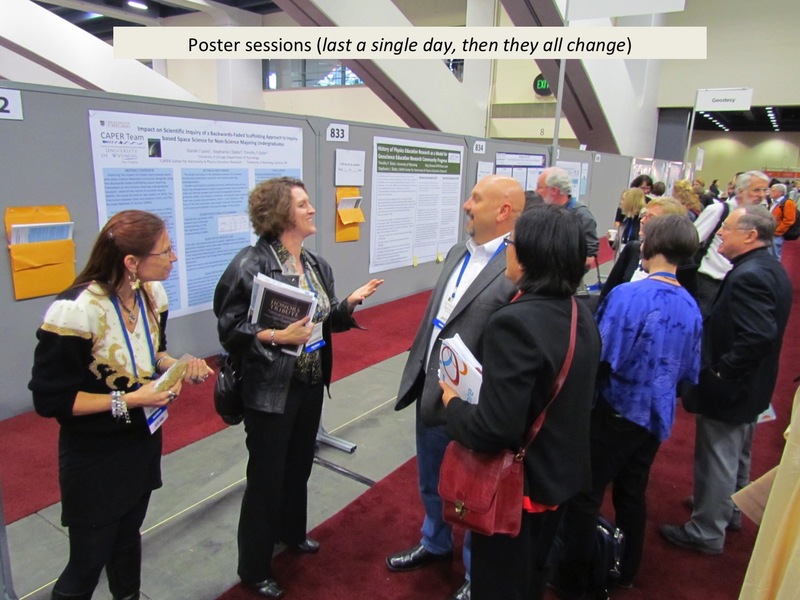 Now, in addition to talks, you will often find poster sessions going on. These are really science fairs for adults. And whether your conference you are going to has more papers being presented or more posters really depends on the nature of the conference. At some conferences, the poster session is where it’s at. Everything goes on at the poster session. Everybody meets at the poster session. There can be beer served at the poster session. There can be free food are the poster session. On the other hand, at some conferences there’s almost no poster session whatsoever and everything is done in the form of contributive talks and contributive papers. Or sometimes they won’t assign them times at all. But what people will do is they will self-assign times. So right in the middle of that screen there is a sign that says poster #833 and beneath that is a piece of paper. And on that piece of paper it will say, “I will be at the poster from blank to blank.” and people write down what times they are going to be there. For conferences like the AGU, or the American Astronomical Society, these poster session is where much of the the socializing happens. People just go and hang out in the poster sessions. They may not be looking at your poster but that is the place where people get together and chat. So poster sessions are really, really good stuff. It’s where a lot of socializing happens. Something else you may notice about the poster session are there are these brown envelopes hanging on the wall. These brown envelopes hanging on the wall are business envelopes where people have made photocopies of their poster, on 8 ½ by 11, and have them there for people to take. Sometimes people also pin business cards around the bottom for you to take. Or you can have post it notes sitting there and tell people to write notes about the poster and stick them on the poster right there. That way it was kind of a way for them to graffiti a poster, if you will. At the poster sessions, that poster sessions are often places where you can run into somebody famous. Somebody who is walking around maybe it is someone who has written a paper that you really like. Maybe it’s somebody who’s giving a talk that you are really interested in. Maybe it’s somebody you think would be good on a committee of yours. And these are places you can often find them wandering around and not talking to anybody. You should feel completely free to walk up to those and talk to them. You can usually tell in the first thirty seconds if they are conversationalists or not. What I wouldn’t recommend doing, though, is going up and interrupting a conversation. It is usually best to try to catch them in between conversations. Which can be a bit of a trick to doing that. If are looking to meet famous people who are just wandering around that you really want to meet, and you really do want to meet these people, poster sessions are the way to do that. So those are the three really big things that happen at conferences, the plenary invited talks that everybody goes to, the contributive papers that the speakers go to, and they can be anywhere from six minutes, which is very, very short to thirty minutes, which is relatively long, and then there are poster sessions that sometimes last all day. And all three of these things are very different ways of sharing science at a conference. Beyond the big three, another thing that happens at conferences are panel discussions. And you probably saw this in your reading. Panel discussions are where you get a series of experts together to present their views and argue with each other. Specifically, they talk to one another and let the rest of the audience listen in about what’s going on. Now, for my nickels, panel discussions in and of themselves are just ‘ok’ things to listen to. What’s really important is if you are able to become the organizer of one of those panel discussions. What happens if you are the moderator is you get to interact with each of these speakers and you get to get together with them early, maybe meet an hour and a half before the session and have coffee with them. Even better, if everyone is able to be there the night before, what you do is you have a panel dinner where everybody gets together at a restaurant. You get to pick the restaurant. Everybody pays their own way and you get to spend an hour and a half eating drinking and having conversations with really important people in the field who are experts at the kind of things you would want to pay attention to. So panel discussions are really, really neat things to put together because it allows you to get to know people you wouldn’t otherwise get to know. Meetings are really for networking. They’re really, really for meeting people. That’s why they are called meetings. So I encourage you to take advantage of as many of these avenues things as you possibly can. 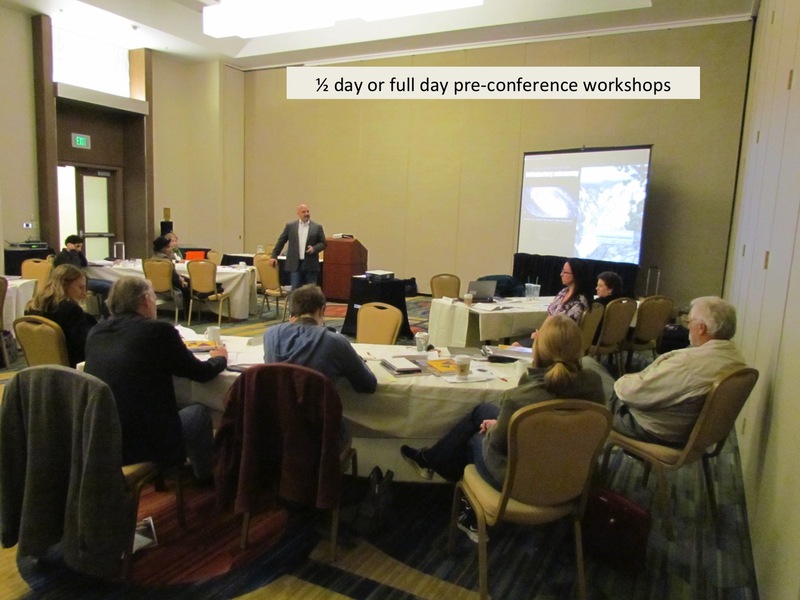 In addition, many conferences also offer half-day workshops, or full day, or once in a while even two-day workshops. 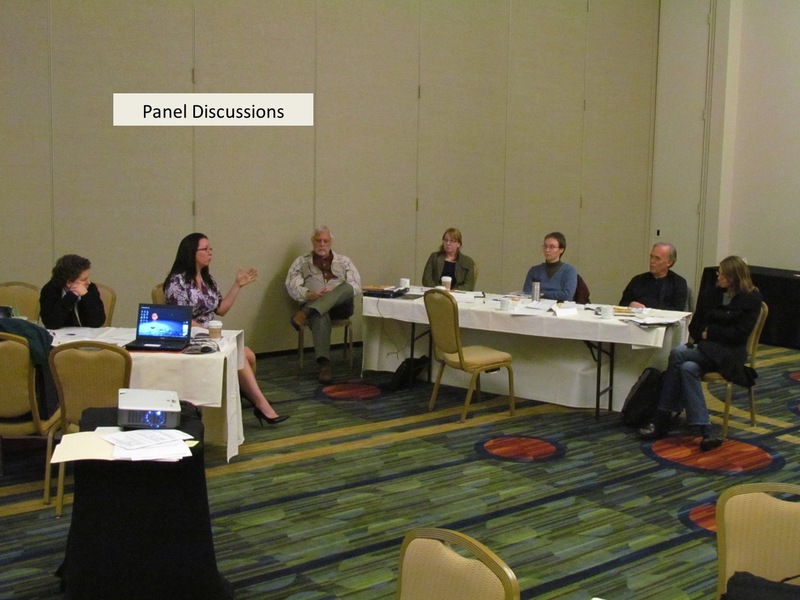 At CAPER Center for Astronomy & Physics Education Research, we tend to offer a lot of workshops because this is a good place to get to spend a lot of time sharing research ideas you have, sharing the instructional strategies you’ve been working, and on getting to know people pretty well. Often these workshops are run by book publishers, by computer programming software people, even by hardware telescope people who often are going to be running workshops—and often you get free stuff. So that’s usually a good reason to go. Usually you get free coffee. Sometimes you can get free breakfast and free lunch. So workshops are often a good thing. They usually do charge a little extra to go to these workshops usually to cover the cost of coffee and registration. And it’s going to cost an extra night or two of hotel rooms, but again I happen to think all day conferences is a really good way to get in-depth study of a particular kind of thing. 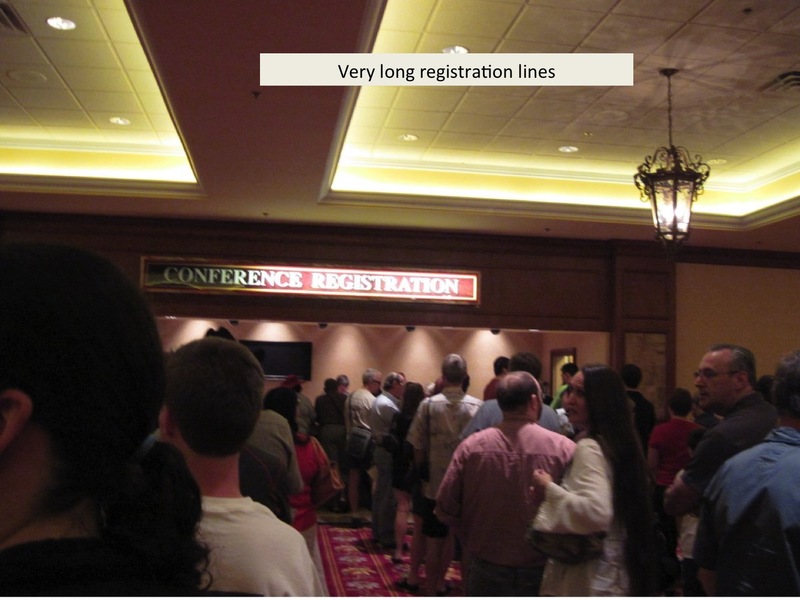 Now in addition to the plenary talks, and the contributive talks, and the poster sessions, and the pre-conference workshops, one of the things you are going to find are really, really annoying very long registration lines. Why is it a bunch of scientists who pride themselves on speed and efficiency can’t figure out how to do fast registration? I just don’t know. Some places you are able to get your registration information before you get there or download it online and can avoid these long lines. If there is anyway at all you can avoid these long lines you need to figure out a way to do it. Every conference is a little bit different in how you pull that off. Sometimes of you go really early or really late or sometimes in the middle of the day or sometimes even if you wait half a day before going and registering all those things can help. But when you get to the front of this very long line they give you a whole bunch of promotional material that you really aren’t interested in and you really don’t need. Usually they give you a really big heavy meeting booklet. 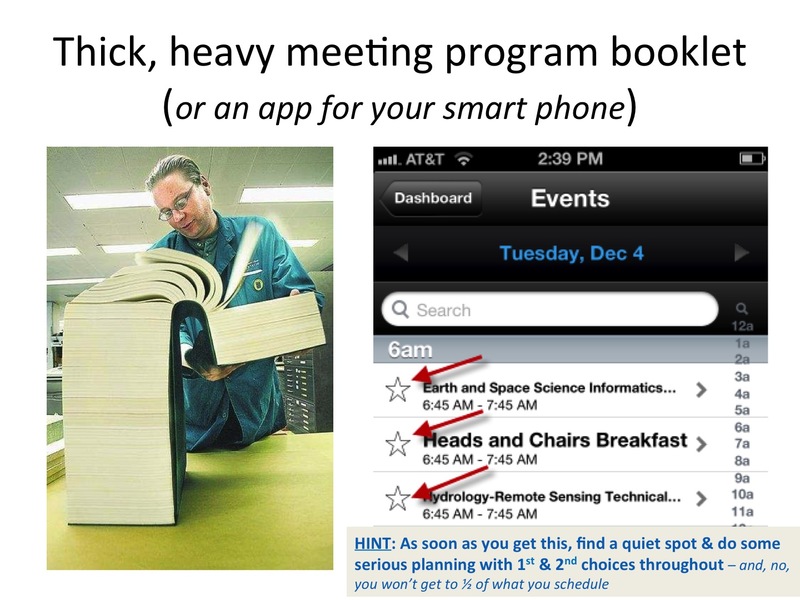 Recently, some conferences have started figuring out how to do apps. iPad apps, iPhone apps, Android apps and these are really, really cool things, because you get all your information, you can go through it and figure out exactly what you would like to do and schedule things out so you know where you are going when. So as soon as you get your big book, or get your app, the first thing you want to do is spend some time going through it. And you want to pick, throughout the day, two things that you would like to do. You always want to have a first choice and a second choice. The reason you want to have a first choice and a second choice is sometimes you go to the room of your first choice and it will be completely full and you just can’t get in, so you want your second choice. Sometimes what you’ll want to do is you’ll want to go into your first choice and it really, really is terrible. That speaker is just awful and so then you will want to be able to go to your second choice. But sometimes you won’t get to your first choice or get to your second choice because you are busy meeting with somebody out in the hallway that you have always been wanting to meet or you are going to spend all meeting figuring out how to meet. So you are just going to miss half the stuff you want to do. That’s just the way it is. Some things are video taped, or audio taped, or digitally recorded and put onto websites. Most are not. But again, you want to be sure you do a lot of preplanning, because if you are sitting there at 8 o’clock trying to figure out what you want to do at eight thirty you are going to be in a real mess. So take some time, even if it’s just a half hour away, to get that stuff figured out. What’s most important when you register is getting your name badge. The name badge serves a bunch of really important functions. One function it serves is it has your name on it. And if you wear it and you are walking around then people can talk to you and call you by name and even remember your name. Your name badge probably also has a barcode on it. And that barcode, whether it is a barcode or QR code, is very useful because when you go to the exhibit hall, which we’ll talk about here in just a minute, vendors can zap your barcode and they have you on record and they can send you free stuff and add you on their mailing list, which of course you can delete. But often you get free stuff. So your name and your location is on your name badge. 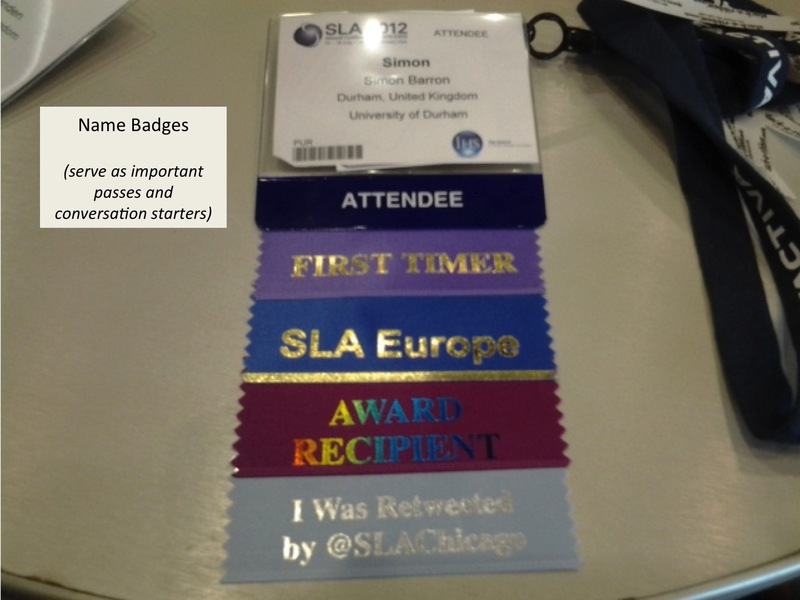 And then underneath your name tag, at some conferences, they have a bunch of crazy stickers on there. These stickers are very, very important. Because these stickers, sometimes you get them at the registration desk, sometimes you get them as you are wandering around the conference, these are great conversation starters. If you see someone you would like to talk to, and you have no idea how to start a conversation ask them about one of their badges, stickers, even if you know what it means, ask them about it, because people seem to wear things pretty proudly. Reminds me of the old Steve Martin bit. He was doing movie called LA Story about living in Los Angeles and there is a particular scene where he is sitting at a dinner party next to this women and the person next to her goes, “hey did you know that Susan is taking courses in conversation?” Steve Martin goes, “Really? That’s fantastic!” and the lady who is taking the courses says, “Yes.” So remember you are dealing with scientists. And so scientists often aren’t very good at conversations so these things will help you help them to have a conversation. The bottom line here is that I recommend you take your name badge very, very seriously. In addition, your name badge will get you into receptions. 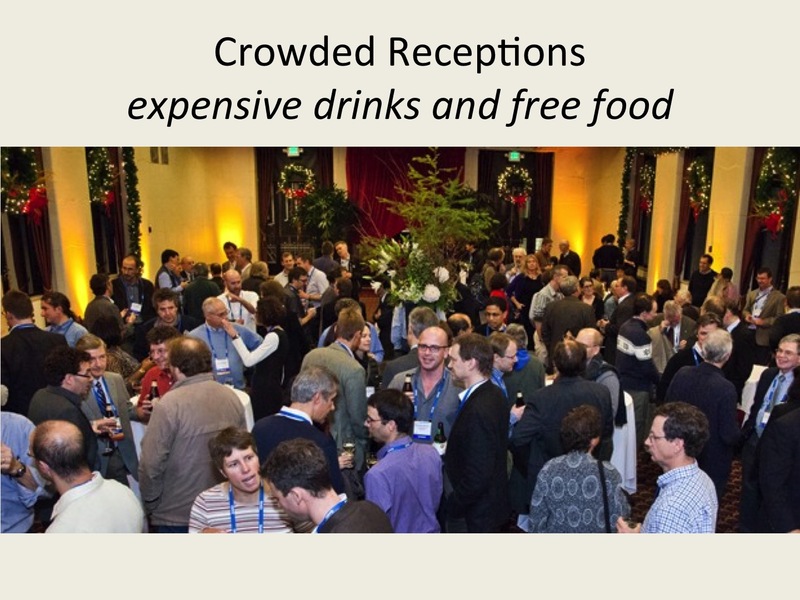 There are a gazillion receptions that go on at these conferences and they are characterized by two things. Number one, they are characterized by expensive drinks, I mean like $8.00, $10.00, $12.00 for a beer, and often free food. Let me put the emphasis on free food. Now notice that there are a gazillion people there. They eat that free food really fast. So if the reception starts at 6:00 don’t show up fashionably late at 6:20. Show up there at 5:55 get your free food and then head over to the bar to get yourself an expensive drink, because there is another reception starting at 7:30 and you want to make sure you are ready for that reception at 7:25. Again the free food things don’t last for very long, but you can reception hop, to reception hop, to reception hop. You don’t want to have your backpack with you; you don’t want to have your coat with you, or your briefcase. You may not even want to have your purse with you; because things are tight they are crowded. You don’t want to carry anything. They are typically noisy but everybody is there and it is a great place to meet people. And if you tell people you are a graduate student sometimes people will buy you drinks. I have been telling people I am a graduate student for years just to get free drinks. No not the bartenders. The bartenders won’t give you free drinks, but often whomever you are talking to will because they will take pity on a poor graduate student. Now one of the things I should point out here is the way you purchase drinks here is very strange in some cities. In general, you do not give the bartender money. In general, there is somebody standing next to the bartender that you give money to and that person then gives you a ticket and you go stand in the bar line and buy drinks from them. Why this is true I just don’t know. 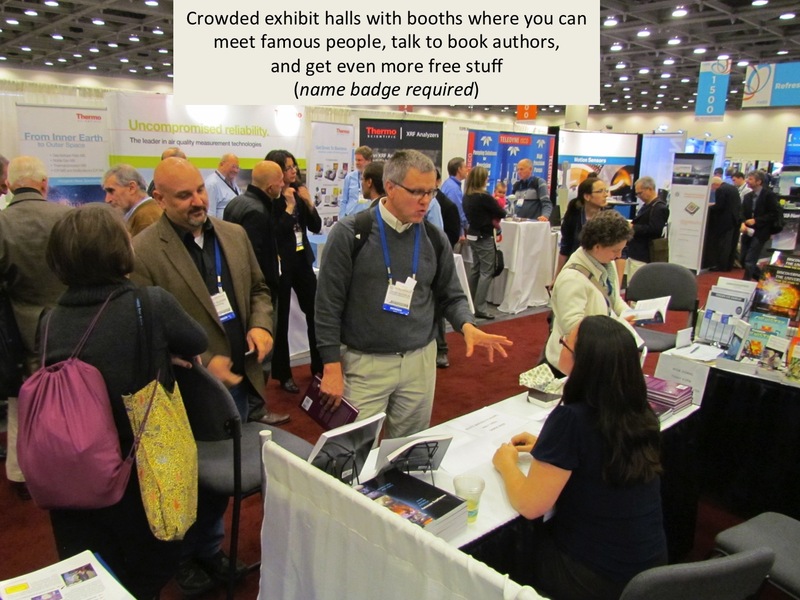 Let’s talk about something that is perhaps surprising to you–exhibit halls. In addition to plenary talks, invited talks, poster sessions, panel discussions, and standing in long lines, and going to receptions, there are exhibit halls. The exhibit halls, I’ve got to tell you, are where I spend most of my time. These are where you get to meet famous people, you get to talk to book authors. Many of these booths have free stuff. Maybe its free books, maybe its free pencils, maybe its free mouse pads, maybe who knows what kinds of things are there. These exhibit halls at some conferences that are very small; it will take you five minutes to walk through. 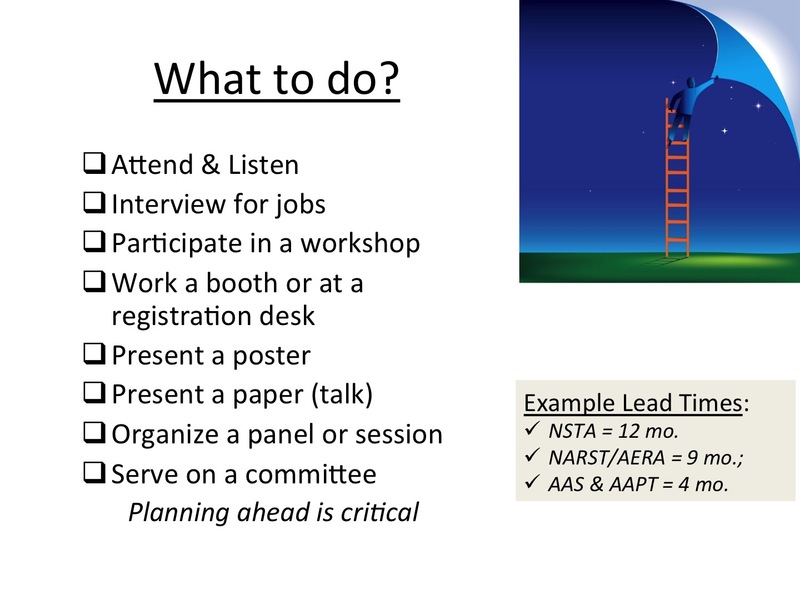 Or some places, like NSTA, can be incredibly large and they will take you literally eight hours to get through. Some conferences have not only has commercial vendors, but also have a lot of scientific equipment vendors. And so it is often really fun to go through and see the telescopes, see the compasses, and see the geodesic domes, all kinds of crazy things that you have. It’s a really, really good place to spend quite a bit of time. One of the reasons it’s a good place to spend quite a bit of time is often they have free food, free coffee, and at places like AGU they will often have free beer. And I don’t mean cheap beer I mean really good beer. And you can get free books sometimes too. All you need to do is go to a publisher who publishes books for courses you teach (or someday might teach). You can say, “Hey I am in the market for a new book. I’m teaching this new class next fall. I’ve never taught this geology class or this astronomy class, I’ve never taught this chemistry class and I’m trying to decide what book to use.” Often you let them write your name down and your email address they will give you free copies of books. Now for those of you who have been in the K-12 world, those conferences do not often give away free books to teachers like they will in a college world. In higher education world, in college university science world free books flow like water. So you can often get free books there. 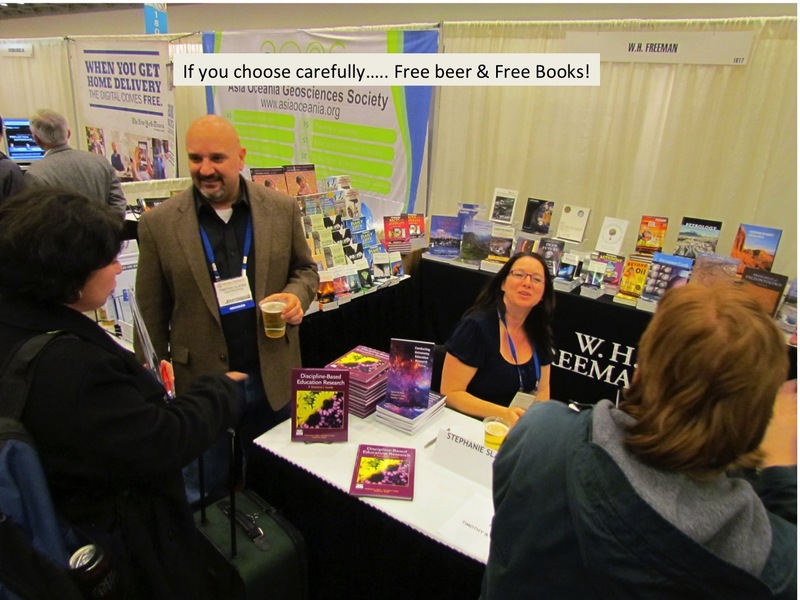 The authors are often standing there during beer time. So you can go by talk with them, you can have them sign your books for you. Which is really kind of a fun thing to do. Sometimes, they will even sign your books for you, which is very cool. Really, don’t miss the exhibit halls, just find out from people what time the free beer is served. You don’t want to be there at one o’clock and get yourself all worn out if the free beer isn’t there until five o’clock. Some serve ice cream during the day! Finally on the last day of the conference the last hour of the conference vendors are not allowed to pack up anything early, but they start looking at all the books, all the materials that they have there and they are saying, “you know what? I really don’t want to ship all this stuff home.” And many vendors will start giving you stuff. They will give you aquariums. They will give you posters. They will give you books. They will give you butterflies. They will give you hermit crabs. They will often give a lot of stuff away during the last hour. So if you have something’s that you want, that you would like to have but you don’t want to pay for, go to the exhibit hall on the last afternoon and politely poke around. And you know to be completely honest part of going to conferences also has to do with where you are going. The AGU conference where many of these pictures were taken was in San Francisco. It happens in December. It happens right before Christmas, so everything is completely decorated for Christmas. This is Union Square in San Francisco. You can see pictures, excuse me, you can see all the windows of Macy’s all which have giant wreaths in them. They also have puppies in the windows from the humane society. San Francisco is also famous for the number of homeless people it has and the creative ways that they have to chat with you and make you feel uncomfortable. If you go year after year, you get to hang out with friends that you’ve known a long time. If your family gets to go with you, you get to go to really fantastic beautiful places and do science at the same time. So you cant ignore this idea of traveling. I think that’s a pretty important thing to remember that traveling does happen. And you should take in some of the sights. 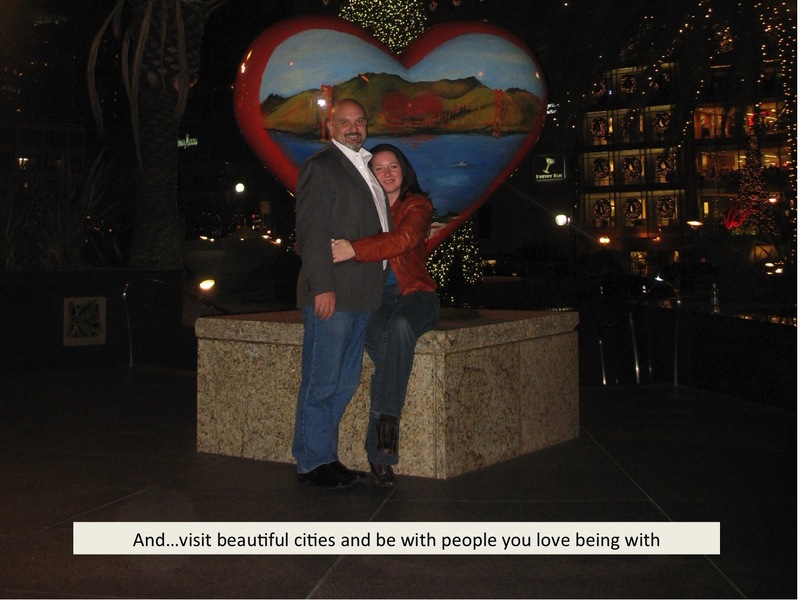 You don’t want to skip the meetings to do those things, but what I would recommend is if you want to go explore a city you haven’t been before to go early to do your exploration. Because by the end of the conference you are so tired you are not going to want to the zoo or go see anything. You really should try to find a way to get to one professional conference a year, even if it has to come out of your own pocket. Because at these professional conferences that’s where people are giving talks about papers that won’t be published for eighteen more months. It’s where a chance to meet people for research collaborations, for committee assignments, for people to write you external letters for review. But, cost is a real issue. 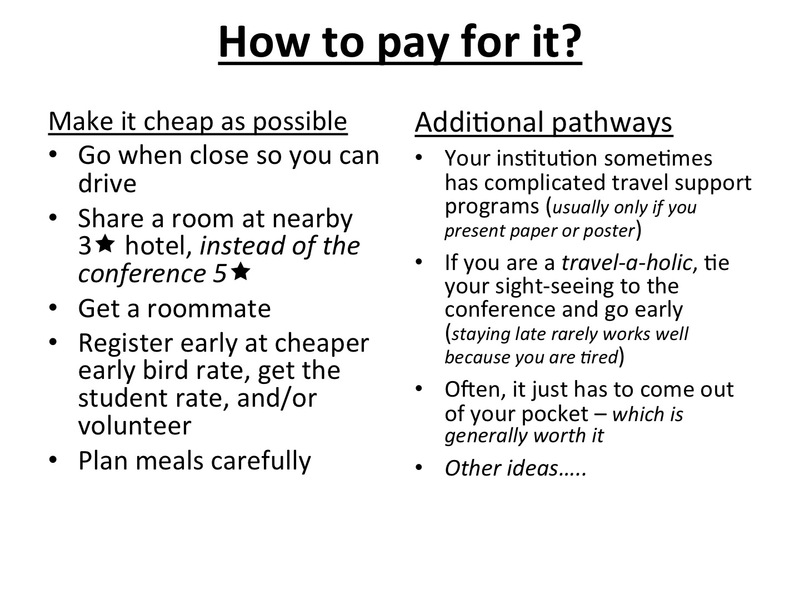 Some conferences allow you to volunteer to cut down on registration costs. Others cut the cost if you sign up early. Registration at some of these meetings can be extremely expensive. If you are a member of that society often you get a big discount break, but if your university is paying for your trip they will not pay for your membership. So some people will not join an organization, go ahead and pay for the higher cost registration because their university doesn’t reimburse them for the cost of a membership. Another strategy is to share a hotel room. For me, the hotel room is the most expensive part of these conferences, particularly if you stay in the conference hotel. Sometimes right next door to the conference hotel there is a Best Western or a Hampton Inn, which can be half the price. Often the lower price hotels have free breakfast. The lower price hotels often have free Internet. Because people who go to the five star hotels have budgets to pay for their Internet, pay for their parking and to pay for their breakfast. Often you get a better deal both food wise and price wise if you can find a cheaper hotel next door, as long as you feel safe. We have talked about invited talks, contributive talks, poster sessions, exhibit halls, panel discussions, registration lines, name badges, program booklets, program apps, and how to find free beer, and how talk to people. That’s a lot to manage; and it’s totally worth it! Unquestionably, the currency of academic scholarship is refereed publications. Although many scholars enjoy juxtaposing and debating a “quantity of pages” versus “quality of impact on the field” ad infinitum, the question most researcher want to know is simply, “how can I have my best work meaningfully refereed and made accessible to the academic community?” What was one a rather straightforward question just a decade ago has become increasingly complex as the world of academic publishing is rapidly evolving. It was in response to the question of “how best to publish” that motivated us to create the new Journal of Astronomy & Earth Sciences Education – JAESE. We’ve spent quite a bit of time creating this publishing vehicle for the science education research community, and it is something that we’re quite proud of. Unfortunately, it has been off-handedly suggested that JAESE might be a predatory journal or perhaps a place too new for faculty seeking promotion and tenure. I, JAESE’s Editor-in-Chief, along with JAESE’s guiding Editorial Advisory Board can assure you that JAESE is not a predatory journal. Moreover, a quick glance at our list of well-known editorial board members or a read of the high quality of papers JAESE has already published should be enough to put any such fears to rest. If you haven’t heard of predatory journals before, predatory journals are those publishing entities that charge authors exorbitant fees to publish their research articles, regardless of the scholarly quality and without any meaningful peer-review. Predatory journals have shown up in the news quite a bit lately because of an instance where an India-based journal publisher quickly accepted and published a submitted but nonsensical, computer-generated article and invoiced the imaginary author several thousand dollars with a single-word editorial review of, “excellent.” JAESE isn’t one of these publication-mills. JAESE is an open-access journal. This means that its peer-reviewed articles are freely available to readers and libraries without a subscription. Whereas traditional publishers cover their costs by surprisingly large subscription fees to libraries, open-access journals charge authors or their institutions a page-charge fee to cover their costs, including copyediting, layout, indexing, permanent storage, stable access, and curation. In other words, one can’t simply put up a website and call it a journal, as permanent storage, indexing, and stable URLs are important and not as easy as it might seem. JAESE wasn’t created overnight. Instead, the current form of JAESE is a result of two years of collaborative planning, including the competitive selection of an experienced, US-based academic publisher. Part of that planning includes the creation and engagement of both an Editorial Advisory Board and a Board of Reviewers who are highly respected and well-known scholars (viz., http://JAESE.org), including former journal editors, who oversee the JAESE Editor, who is also himself an experienced senior scholar. Part of the motivation to create JAESE is based upon (i) the void created with the cessation of the Astronomy Education Review, (ii) the large number of manuscripts received by Journal of Geoscience Education, and the non-library subscription nature of the Journal of Research in Astronomy Education & Outreach. Its not like there are an overabundance of places for discipline-based education researchers to publish, and most scholars seem to welcome new avenues that use new business models. Recent discussion about predatory journals has been further fueled by an exuberant, list-making librarian at the University of Colorado-Denver who has been trying to keep track of the ever-growing, fly-by-night journal publishers, mostly in India and surrounding countries. These groups have created fictitious journals such as the London Journal of Indian Medicine and the Spanish Journal of African Culture. Because it is nearly impossible to fully investigate all of these quickly waxing and waning publishers, including our own, Jeffrey Beall’s list (which has been widely cited elsewhere, although not often critically so) is specifically titled the POTENTIAL, POSSIBLE, OR PROBABLE list of open-access publishers. Unfortunately, JAESE was placed on this warning list of potentially, possible, or probable predatory journals simply because it is funded by open-access publication fees instead of subscriptions: JAESE was placed on this list even before its first issue was released and without any regard to the credentials of the Board or to the quality of the articles included. Suspiciously, all our attempts to contact Mr. Beall so far to correct this or appeal this have been dismissed. In other words, once a journal gets on his list, it seems to be impossible to get off of it. Personally, I judge this to be dubious and Beall’s once deeply appreciated work is now being justifiably criticized by a wide range of scholars. To get down into the weeds of it, Beall’s criteria for being on the list of potentially predatory journals includes: if the publisher is the editor (for JAESE, the publisher is Ron Clute and the editor is Tim Slater – one is tall with lots of hair and the other, well, is not); if there is no substantive or knowledgably editorial/review board (for JAESE, there is a 20-member editorial review board of well-known and highly respected scholars); and if there is little geographic or gender diversity of the editorial board (for JAESE, there is an international representation with a balance of gender). In addition, Beall suggests that potentially, possible, or probable predatory publishers: have weak controls for plagiarism (in addition to having knowledgeable reviewers, JAESE uses software to guard against this); lack stable and permanent article identifiers such as paid DOIs (JAESE uses an internal system with permanent URLs and pays to be deposited in a permanent repository system); are not members of large publishing collaboratives (JAESE’s publisher Clute Institute is an endorsing publisher for the UKSG.org Transfer Code of Practice); and do not have any long-standing history (JAESE’s publisher is based in Denver and has been publishing journals for several decades, with more than 7,500 refereed articles permanently curated in total). One specific criticism of JAESE is that we currently do not use DOI numbers to specify permanent URLs for archived articles. The DOI system was created in the 1990s to solve the problem of unstable URLs when using Netscape and Mosaic to find online resources. Many publishers think that the DOI system has outlived the problem it was trying to solve, especially as membership in the DOI system is expensive for small publishers and, it seems to me, largely unnecessary these days. The JAESE Editorial Board is currently reconsidering DOIs, but members are understandably reluctant to pass more costs on to authors, if it is unnecessary. In the end, the quality of any journal is mostly independent of its business model. Instead, I believe that the quality of any scientific journal should be judged on its usefulness to scholarly authors and accessibility to scholarly readers. Over the decades, there have been many efforts to quantify a journal’s value, like impact factors and citation indexes. I’m not going to bore you with all the ways to manipulate those numbers, but if I haven’t overstayed my welcome yet, I’m happy to tell you some of my opinions. People often ask me about acceptance rates. I will tell you that JAESE anticipates having about a 30% acceptance rate—it might be higher or lower over the long term—but I’ll also confess that acceptance rates as a valid measure of journal quality is completely meaningless. On one hand, the Astrophysical Journal, the inarguable top-tier astronomy journal has a 91% acceptance rate. On the other hand, the Journal of Teacher Education, the best candidate for the top-tier education journal, has a 6% acceptance rate. That’s a magnificent difference between acceptance rates. Which is the higher quality journal? I don’t know in these two cases, but I can tell you that the value for acceptance rate doesn’t seem to have anything to do with it. People sometimes ask me about JAESE’s affiliation with a professional society. To many people’s surprise, most professional societies publish journals specifically as a revenue raising activity in order to fund its office and programs. Both the American Geophysical Union and the American Astronomical Society earn millions of dollars each year through their publications. Across library sciences, a professional society affiliation is rarely considered evidence of quality. JAESE is not affiliated with a professional society, because we want to keep costs as low as possible. Finally, I believe that a solid peer-review system is the best guarantee for having valuable articles in one’s journal. Whereas some journals use only a single, peer-reviewer, JAESE uses a multiple-peer review system. Each submitted manuscript has the authors’ names and their affiliations removed before review, as this has been shown in a variety of fields to influence acceptance. Manuscripts are reviewed by two Review Board members, as well as by the Editor. In cases where there is specialized knowledge being advanced, either scientific or educational, more reviewers are used. The philosophical inclination of our review system is formative, rather than punitive, in an attempt to help authors get their work out when appropriately mature. It is our hope that this review system will enhance the usefulness of the articles and provide valuable feedback to authors. This “blog post” has gone on for much longer than I anticipated, but I felt compelled to explain to our community some of our thinking. It is my deepest hope that JAESE can contribute to the advancement of science education research and I’m always open to hearing your suggestions on how to improve it. The “Journal of Astronomy & Earth Sciences Education” invites education research scholars and public outreach professionals to submit manuscripts across the broadly defined Earth and space science disciplines. Based in the United States and founded by an internationally recognized editorial advisory board, JAESE publishes refereed articles for an international audience in discipline-based education research on teaching and learning across a broad range of disciplines including: astronomy, climate science, geology, geography, energy resource science, environmental sciences, meteorology, oceanography, planetary sciences, and space sciences. In addition to empirical, quantitative and qualitative science education research articles, JAESE publishes essays on innovative teaching strategies and systematically evaluated public outreach programs, using a blind, multiple-peer-review system. JAESE’s first issue is available at www. JAESE.org, and detailed author submission guidelines are available online. JAESE articles are indexed through NASA SAO/ADS, GoogleScholar, ERIC, EBSCO, and ProQuest, among other reputable scholarly citation systems. All articles are open-access, meaning articles are permanently free to readers and libraries without a subscription. The journal keeps costs low by using an established business model where authors or their institutions pay a nominal a open-access curation and publication fee instead of a subscription. Additional information about the journal may be directed to Dr. Tim Slater, Editor, at JAESE@uwyo.edu or found online at http://www.JAESE.org. A long-standing debate in the teaching of astronomy at the college level—and science in general—is whether to teach using metric SI units or customary US-standard units. At first glance the argument seems to be based on two juxtaposed positions. On one hand, US college students are largely unaware of the metric system and therefore need to be provided values for distance in more familiar units. On the other hand, real science is actually done in metric units and students studying in a science class should use the language conventions of science. It is this second position—authentic science uses metric units—that most college science faculty adopt. A cursory survey of most astronomy textbooks reveals that most distance values are given in metric units (with US-standard units often provided parenthetically) in the narrative sections, with data tables using metric units most frequently. Upon further reflection (or perhaps being urged to think more deeply from a learning and cognitive science perspective), one wonders if there is a more nuanced situation here and a more thoughtful approach is warranted? Cognitive science provides at least two boundary conditions to be considered in a more nuanced version of this debate: (i) issues related to novice-vs-expert learning and (ii) issues of cognitive overload. To take a step back, we should acknowledge that the question of which system of units to teach under has been a raging debate for decades (1, 2, 3) . The United States’ historical efforts to go-metric have been a complete failure and are relatively well-known. I don’t have space here—in any unit system—to delve deeply into our metrification attempts, such as unfruitful efforts to change all US highway road signs to metric, which I believe only still exist south of Tucson). For the passionately interested reader, Phelps (4) has written about much of that history. Some professors have found it fruitful to use videos to help teach relative scales, using videos like Powers of Ten. (9- 11) Perhaps narcissistically, Jones and Tretter’s ongoing research suggests that this video works so effectively because the video starts with what people are most familiar with – the size of a human body. Most people understand sizes and scales based on benchmark landmarks and mental reference points from their experiences. K-12 students tend to think of the world in terms of objects that are: small, person-sized, room-sized, field-sized and big. High school and college students also sometimes include shopping mall-sized and college campus-sized objects in their listings. Further, people’s out of school experiences involving measurement of movement have the greatest impacts on their sense of size and scale—walking, biking, car travel—as opposed to school experiences where they have rote memorized numbers from tables. Consistently, it is to these common experience anchors that people use various measurement scales. For us teaching astronomy, this is where the cognitive science issue of novice-vs-expert rears its ugly head (13). Compared to a novice, an expert uses their experiences to automatically and often unawareingly change between scales. For example, when measuring the distance between Earth and Neptune, would one describe it in meters, astronomical units, or light-travel-time? The answer is, of course, it depends on why an astronomer would want to know such a distance. For an expert, using meters, AU, and ly is readily interchangeable whereas for a novice, these are three totally separate determinations. When I ask my students how far it is from where they are sitting to the front entrance of the building, or to the city with the state capital, they can usually give me a reasonably close answer using units of their OWN choosing, often it is time in minutes or hours, or in distances like American football field-yards or miles. If I specify the units their answers must be in, such as feet or kilometers, my college students generally have no idea. Experts are fundamentally different than students. We readily move between parsecs and light-years, whereas our novice students cannot—no matter how much we wish they could. As it turns out, if students could easily move between measurement systems, they wouldn’t be novices, they’d be experts and we teachers might be out of a job. In other words, we can’t simply tell students that a meter is about a yard, and two miles is about 3 kilometers and be done with it—if it was that easy, we’d have done that already and there would be no ongoing debate. One might naturally think that astronomy students should be able to easily memorize a few benchmark sizes (e.g., Earth’s diameter is 12, 742 km and an astronomical unit is 1.4960 E 8 kilometers) and then they could handle almost anything by subdividing or multiplying. The problem is that the characteristic of an expert, as compared to a novice, is that experts chunk ideas more easily, allowing experts to make quick estimates. Novices have no strategies to be able to do this. Moreover, Hogan and Brezinski (14) aggressively argue that an individuals’ own spatial visualization skill level is the most important component in measurement and estimation by portioning and estimating distances. Unfortunately, these do not appear to be directly related to one’s calculation skills and teaching students to convert between units using dimensional analysis heuristics is mostly fruitless. The bottom line here is that students rarely enter the classroom with well-developed sense of scales going beyond their human-body size and experience with movement from one place to another. The cognitive science-based perspective of a novice-verses-experts teaching problem is well-poised to interfere with any instruction where students are being given sizes and scales in units with which they are highly unfamiliar. As if this weren’t challenging enough, there is also the cognitive science-based problem of cognitive load. Cognitive load is the notion that students only have so much working mental capacity at any one time available to apply to learning new ideas. (15). That means when a professor says a comet is 10,000-m across, the Sun’s diameter is 1.4 million-km, the Virgo cluster is 16.5 Mpc, and a quasar is at a “z of 7”, students either have to stop being active listeners to your lecture for 30-seconds and figure out what those units mean and miss what you really wanted them to know, or they have to ignore any referenced numbers all together so that they can keep paying attention. The teaching challenge here is that I suspect the most important thing you want students to take away from a lecture about a quasar at a z of 7 isn’t precisely how far away it is, but instead what it tells you about the nature of the universe. The risk here is that introducing numbers and unfamiliar units gets in the way of the ideas you are most likely trying to teach. The research alluded to earlier points to using relative sizes as being more fruitful for helping students learn than absolute, numerical sizes. I try to rely on things they are most familiar with and then help them to use simple, whole number ratios. For example, North America is about three Texas’ wide, the Moon is about one North America, Earth is about four Moon’s, Betelgeuse is 1,000 times larger than the Sun, and …. Notice I don’t have to say very many of these ratios before you starts skimming to the end of this paragraph yourself : That’s the same experience your students too often have. Fortunately, many modern astronomy textbooks now give planet sizes in Earth-radii, just like we have long given solar system distances in astronomical-unit Earth-orbit sizes (17). I think this is a really good starting place. After all, five years from now when you run into an alumni student, do you really want the one thing that they most remember about your class to be the distance to the Crab Nebula in parsecs? As astronomy teachers focused on student learning, we seem to be left no longer with the seemingly simple question of “should I teach with metric or US-standard?”, but with the more robust question of “do I seriously take on the semester-long task of teaching scales and measurement or do I teach using ratios using familiar distances, which vary widely from student to student in my diverse classroom?” Re-framing the question this way is much more actionable and diminishes the less productive “science versus the rest of the world” notion. I contend that this new either-or question is much more worthy of research and debate. Personally, I have a lot of astronomical ideas with which I want my students to engage. My personal belief is that I’d rather students deeply engage in physical processes and causality of astronomy, stimulated by wonder and curiosity. I further want them to engage in how astronomy is deeply entrenched in society and technology. To do this, I choose to give up on allocating the time necessary to fully teach the metric system and focus my efforts on teaching things in terms of relative sizes and avoid using a self-defeating calculator-task whenever possible (16). Experienced mathematics teachers will tell you that you can’t really teach the metric system with a single 15-minute lecture to novices: Teaching the metric system takes a commitment throughout the entire course. The notion that metric is easy because it is all base-10 is nonsense when it comes to teaching astronomy, despite my desire for it to be otherwise. The bottom line is that I decided that I want to teach astronomy rather than teach the metric system, and I don’t have time to teach both well. My textbook writing solution (17) is that I provide sizes in both metric and US-standard units where it makes sense. Against the common convention, we have made the agonizing choice to include the US-standard units first (with the metric units parenthetically) so as not to unnecessarily put off neither the students who find US-standard units to be less off putting, nor the vast majority of professors who desire their science course to be characterized by the metric units characteristic of science. My eventual, downstream goal is to provide size and scale referents for as many common anchor objects as possible without overloading the students, and focus on allocating serious class-time to teaching the sizes of a few core anchor-sized objects. These anchor objects include sizes of Earth, Sun, Earth’s orbit, average distance between stars, Milky Way diameter, distance to Andromeda, and light-year, to name a few. Fortunately, teaching the distance of a light-year is not either a metric unit or a US-standard unit, and is thus elevated above the present debate no matter what your perspective. Helgren, F. J. (1973). Schools are going metric. The Arithmetic Teacher, 265-267. Vervoort, G. (1973). Inching our way towards the metric system. The Arithmetic Teacher, 275-279. Phelps, R. P. (1996). Education system benefits of US metric conversion. Evaluation Review, 20(1), 84-118. Jones, M. G., Gardner, G. E., Taylor, A. R., Forrester, J. H., & Andre, T. (2012). Students’ accuracy of measurement estimation: Context, units, and logical thinking. School Science and Mathematics, 112(3), 171-178. Tretter, T. R., Jones, M. G., Andre, T., Negishi, A., & Minogue, J. (2006). Conceptual boundaries and distances: Students’ and experts’ concepts of the scale of scientific phenomena. Journal of research in science teaching, 43(3), 282-319. Jones, M. G., Tretter, T., Taylor, A., & Oppewal, T. (2008). Experienced and novice teachers’ concepts of spatial scale. International Journal of Science Education, 30(3), 409-429. Slater, T., Adams, J. P., Brissenden, G., & Duncan, D. (2001). What topics are taught in introductory astronomy courses?. The Physics Teacher,39(1), 52-55. Jones, M. G., Taylor, A., Minogue, J., Broadwell, B., Wiebe, E., & Carter, G. (2007). Understanding scale: Powers of ten. Journal of Science Education and Technology, 16(2), 191-202. Hogan, T. P., & Brezinski, K. L. (2003). Quantitative estimation: One, two, or three abilities?.Mathematical Thinking and Learning, 5(4), 259-280. Sweller, J. (1994). Cognitive load theory, learning difficulty, and instructional design.Learning and instruction, 4(4), 295-312. Slater, T., & Adams, J. (2002). Mathematical reasoning over arithmetic in introductory astronomy.The Physics Teacher, 40(5), 268-271. This is a great time to be teaching introductory astronomy. Th ere are an overwhelming number of astronomy and planetary sciences teaching resources available to professors and teachers. To help you navigate this astronomically large universe of astronomy teaching resources, we provide our TOP FIVE list of ready-to-use, high-quality, FREE ASTRONOMY TEACHING MATERIALS as a starting place. ONE: IMAGE LIBRARY. You need a readily available source of high quality astronomy and planetary science images and explanation to share with your students. TWO: CLASSROOM QUESTIONS. You need a source of classroom-ready questions to pose to your students to start discussion and to give them feedback on their developing understanding. THREE: GRADING SYSTEM. You need a homework assignment strategy to help students engage with astronomy concepts outside of class time. FOUR: CLASSROOM ACTIVITIES. You need a collection of collaborative group activities to use during class-time to interrupt your lecture and improve student learning. FIVE: TEST-QUESTION LIBRARY. You need a giant test-bank of well-written, multiple-choice questions either for creating exams or for students to use in studying material.